When Karl Lagerfeld draws on Greece for inspiration for the fashion powerhouse of Chanel he doesn’t bother trying to obtain permission to stage a show at one of the country’s ancient monuments (unlike Gucci which tried to secure the Parthenon, but had its request rejected in February). Instead, he simply orders his team to erect his own version. 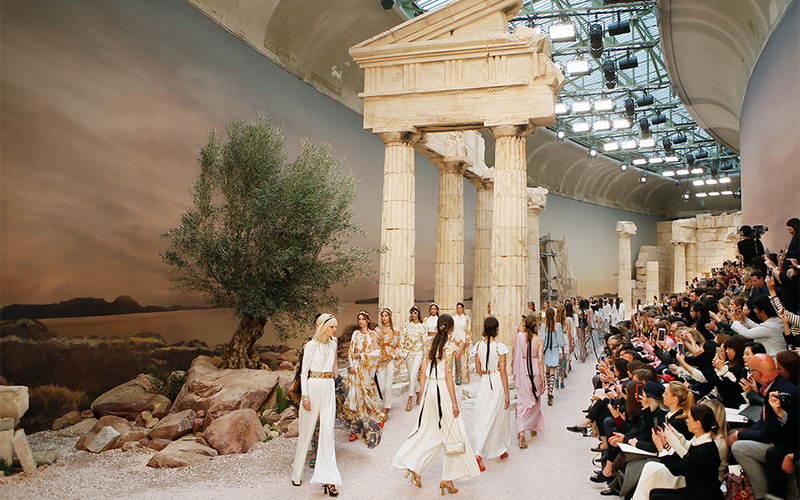 Against an iconic Greek backdrop, which included a sunset as well as reproductions of parts of the Parthenon and Sounion’s Temple of Poseidon, the Chanel Resort 2018 show – the luxury brand’s more “relaxed” version – was shown at the Grand Palais on Wednesday in Paris. Erected for the city’s International Exposition in 1900, the Rive Droite building has been a regular host of the fashion house’s ready-to-wear collections over the past few years. Chanel was established in 1909, while Lagerfeld has been acting as artistic director since 1983. On Wednesday, marble, sand and olive trees were used for the elaborate setting of 15-minute show which immediately made waves in cyberspace, not unlike last year’s resort catwalk held in Havana, Cuba, which featured Fidel Castro’s grandson, among others. “Reality is of no interest to me. I use what I like. My Greece is an idea,” Lagerfeld told The New York Times on the subject of his “Greek” collection. Titled “The Modernity of Antiquity”, it included motifs from ancient Greek vases, “goddess” silhouettes, golden detailing on garments and hairpieces, toga-like draping and the evening’s hot accessory: monochromatic high-heeled sandals with elaborate straps. 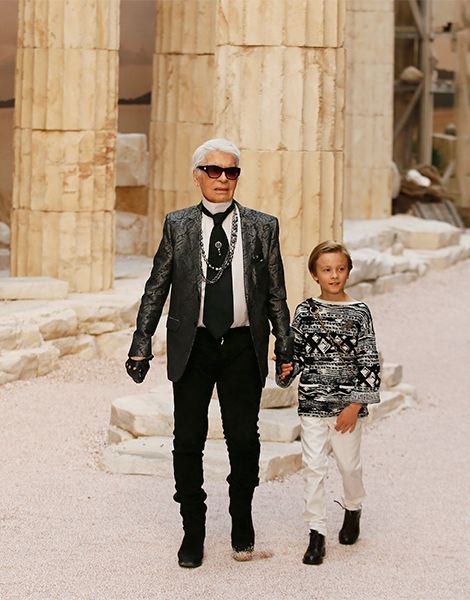 It’s nice to see Greece lying at the heart of a figure like Lagerfeld’s inspiration. In Chanel’s case this is doubly true, given that the French house recently unveiled an anti-ageing serum which includes Greek mastic extracts. The product’s international campaign highlighted the island of Ikaria as one of the places where people live longer and better. Lagerfeld, of course, is not the first to take inspiration from the world of antiquity. Before him, designers like Madeleine Vionnet, Madame Gres and even Alexander McQueen (for his debut show at Givenchy) have interpreted 2,500 years of history in their own way. Meanwhile, several Greek designers are also drawing on their heritage and its emphasis on clean lines and overall simplicity. In short, Greece will never cease to inspire.